This double duty charger bracelet looks like a sleek braided accessory with metallic accents—and it is—but it’s also a charging cord for USB-C, Micro-USB, and Lightning devices. Now you’re always prepared to connect to things like a laptop, USB port, or power bank without carrying a cable with you. Water-resistant and reinforced to prevent fraying. Dimensions: 4" x 3" x 0.8"
The team at Torro, lead by Will Torrez, set out to create a solution for powering up devices on the go—but they wanted to take a stylized approach. Their sneaky solution? A braided bracelet with shiny metallic accents that presto-change-o’s into a charging cable. 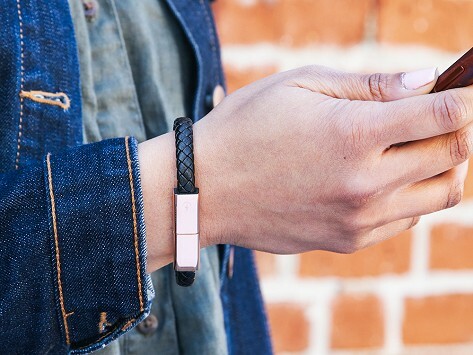 A Torro bracelet-meets-cable can connect to things like a phone, laptop, back-up battery, or USB port. Pick from a Lightning, Micro-USB, or USB-C design. It’s water-resistant and has extra protection to help prevent fraying, so you can wear one as an everyday accessory without worry. As great as the bracelets look, the convenience of wearing one really won us over. Now you can always have a cable on hand—or make that your wrist.